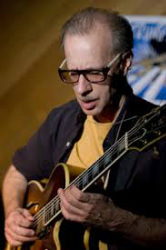 In 1972, Joshua Breakstone entered New College of the University of South Florida (Sarasota, Florida), where he graduated in three years - including two terms at Berklee College of Music (Boston, Massachusetts) - in 1975 with a degree in Jazz studies. After graduation Joshua spent several months in Brazil, then moved back to New York where he taught and performed while taking graduate courses at NYU. In 1979 he made his recording debut on Canadian reedman Glen Hall's Book of the Heart (Sonora Records 101), with JoAnne Brackeen, Cecil McBee, and Billy Hart. During the period leading up to his first recording as a leader in 1983, “Wonderful!” (Sonora Records 222 with Barry Harris, Earl Sauls, and Leroy Williams), he was residing in New York, performing with people like Vinnie Burke, Warne Marsh, Emily Remler, Dave Schnitter, and Aaron Bell, teaching both privately and at the Rhode Island Conservatory of Music (Providence, Rhode Island). “Self Portrait in Swing” followed in early 1989 followed by 1990's “Nine By Three”, Breakstone's first trio recording, with Dennis Irwin and Kenny Washington. 1986 was the year of Joshua's first Japanese tour. Since that time he has toured throughout Japan, usually twice a year, both with his own groups as well as with the groups of such noted Japanese musicians as Terumasa Hino, "Monkey" Kobayashi, and Eiji Nakayama. In 1991 Joshua began recording for the Japanese King Record label, an association that led to four recordings. “Walk Don't Run” was followed by “I Want to Hold Your Hand” and “Oh! Darling”- two CDs of Beatles compositions rearranged and adapted to Breakstone's musical point of view. On all three are heard the formidable rhythm section of pianist Kenny Barron, bassist Dennis Irwin, and drummer Kenny Washington. The subsequent “Remembering Grant Green” features Grant Green bandmates, organist Jack McDuff and drummer Al Harewood. Kenny Barron returns, as well, on two tracks, this time with bassist Ray Drummond and drummer Keith Copeland. “Sittin' On the Thing with Ming”, his 1993 debut recording for Capri Records, consists mostly (except for one selection) of Joshua's original compositions. 1996's “Let's Call This Monk”, with bassist Dennis Irwin and drummer Mickey Roker marks Breakstone's debut for the Double-Time label. In 2000 he recorded a subsequent tribute to another of the great Jazz pianists with his “The Music of Bud Powell”. Sandwiched in between on Double-Time was his 1999 “This Just In”. This was followed by his 2001 recording, “Tomorrow's Hours”, a tribute to Wes Montgomery and 2003's “A Jamais” (Forever). “A Jamais” was followed in 2004 by “Memoire”, also recorded in France with French musicians. In 2009 Joshua recorded again for Capri Records, “No One New” with bassist Lisle Atkinson and drummer Eliot Zigmund. The same group was back in the studio recording “With the Wind and the Rain” in 2013 but with the addition of cellist Mike Richmond.